The Rough Collie breed has been mentioned in writings dating back to the 14th century. It was used primarily as a herding dog. Kind, loyal and trainable, the Rough Collie is affectionate and makes a fine family companion. The Rough Collie needs regular outdoor exercise. Though not an excitable dog, it enjoys attention and activity. Size: An adult may measure from 22-26 in, 56-66 cm at the shoulder and weigh from 50-75 lb. 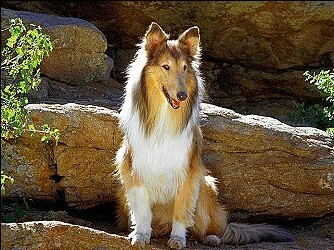 Coat: The Rough Collie`s crowning glory is its harsh, straight and abundant outer coat. However, the coat is short and smooth on the head and legs. Underneath the glamorous outer coat, the Rough Collie wears a soft, furry, dense undercoat. Grooming: The Rough Collie`s coat needs frequent, thorough brushing to remove dead hair and keep the undercoat from matting. The breed needs extra attention at seasonal shedding times.